Click banner for full tour schedule! When writing I generally listen to songs by Angels and Airwaves as I concentrate better with them on in the background. This rule applied when writing Familiar Ties, however recently I have grown an attraction to “Take a Chance on Me” by JLS, this song shows the relationship between Max and Amy and how she is too scared to go back to him because she is scared of getting hurt. Another song that works well with the book is “Unforgettable” by Caitlin Stasey and Dean Geyer, although this song isn’t very well known the lyrics let the reader hear Grace’s P.O.V in certain parts of the book, with her relationship with Max. 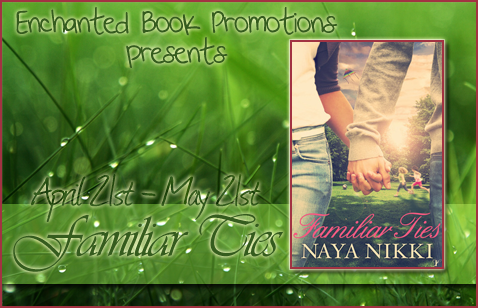 Thanks for sharing your thoughts on how music ties in with Familiar Ties, Naya! Born and raised in London, England, Naya Nikki is a student who’s spent most of her life taming her creative streak through writing short stories. 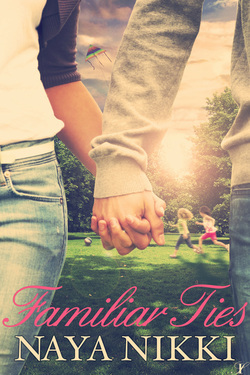 She’s signed her first contract with InkSpell Publishing to publish her first book “Familiar Ties.” The story follows the journey of two single parents whose daughters want nothing more than for them to become a happy family. She is currently earning a degree in English with a minor in Creative Writing that will allow her to build her writing career. When she isn’t at the university, Naya loves nothing more than spending time with her parents and grandparents as well as meeting her friends for gossip sessions over some hot coco.